NOTE: Most concussions DO NOT include a loss of consciousness. Loss of consciousness occurs in less than 10% of diagnosed concussions. The types of activities that can cause a concussion include falls, collisions with people or objects, and motor vehicle crashes. Concussions can happen at home, school, or work; or during sports or recreational activities. If there is a history of concussion, even a minor hit to the head or body can trigger symptoms. MYTH: The person is not showing any signs or symptoms of a concussion. FACT: Signs and symptoms of a concussion can be delayed for several hours or even a few days following an incident. NOTE: Following a potential concussion causing event, the person should be observed for signs and symptoms for 48 hours before assuming that a concussion has not occurred. The following is a list of signs and symptoms consistent with a concussion. If any of these signs or symptoms are present, medical attention should be sought. Seek medical attention if the person is showing behaviour that is unusual for them or concerns you. The real danger of most concussions occur when the injury is not recognized or is managed incorrectly. Returning to activities too early can put a person at increased risk for future concussions, prolonging their symptoms and potentially leading to serious complications. If someone shows any of the following Red Flag Symptoms, call 911 immediately. The Concussion Incident Report was developed to help you document a potential concussion-causing incident. It outlines how to respond to a potential concussion at the time of the incident, and provides important information on caring for the person at home. NOTE: It is important to know that any advice or directions given to the person at the time of incident may not be remembered. The Concussion Incident Report is an important communication tool for sharing information from the scene of the incident. Symptoms should decrease over the course of time. Follow-up with a medical professional if you are worried that the person is not improving or that symptoms are prolonged. The first and most important step in a person’s recovery from a concussion is REST for a maximum of 2 days. The person will need both physical and cognitive rest after sustaining a concussion to allow the brain to heal. The goal is to not trigger or worsen symptoms. Physical activity after 2 days means participation in daily life activities that do not result in an increased heart rate or breaking a sweat. Restrict: exercise, sports, running, biking, rough play. Cognitive activity after 2 days means limiting activities that require concentration and learning. Restrict: reading, electronics (computers, smartphones, video games, TV), work/schoolwork, playing musical instruments, listening to loud music, socializing. Once symptoms start to improve, or the person has rested for 2 days maximum, the person can begin to increase activities and focus on returning to school, work, sports, etc. Symptoms may return, worsen, or new symptoms may appear as new activity levels are introduced. If this happens, return to a lower level of activity that does affect or bring on new symptoms. It is important that the person has successfully returned to school or work before fully returning to sports or physical activities. Returning to physical activity too early may result in more severe or potentially long-term problems. Social interactions are important in preventing social isolation, depression, and anxiety. Some suggestions of low-level social interactions include short conversations on the phone with friends and family, meeting someone for coffee or a short visit. 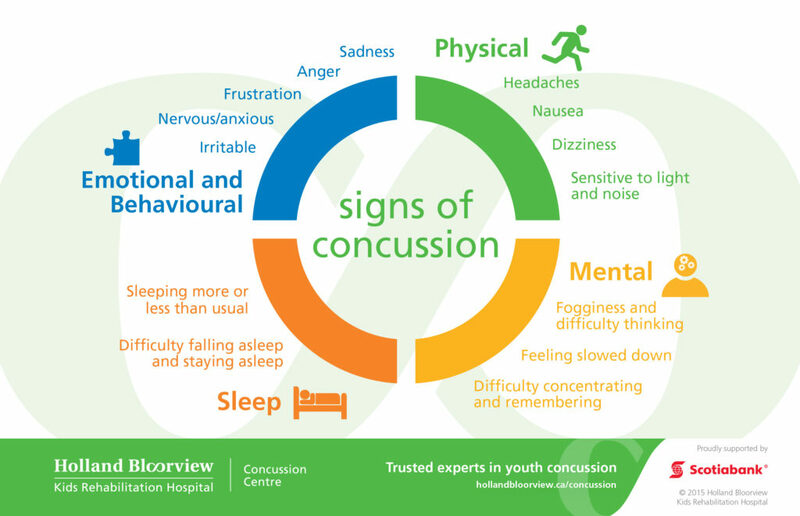 A concussion can cause emotional or behavioural changes. It is normal to be anxious, irritable, angry, or depressed after sustaining a concussion. The person may worry about school, work, or social isolation and being away from their peers. Offer encouragement and support as the person works through the graduated stages of return to activity. Depression can be a long-term consequence of concussion. The person may feel depressed due to a loss of place at work, school, on a team, or in a social group. Depression in some children and youth can be the result of physical changes in their brain associated with the injury itself. Seek medical attention or counselling for support in dealing with emotional or behavioural difficulties. Educating yourself is the first step in preventing concussions and reducing associated risks in yourself and others. You can further educate yourself by taking the CATT training and visiting the Resources section, where you will find concussion information, including videos, reports, handouts, and articles. Helmets DO NOT prevent concussions. Helmets and mouth-guards are vital pieces of equipment that protect from serious skull and dental injuries, but they do not prevent the brain from moving around when there is an impact to the head. Ensuring that you have the required equipment for the sport or activity, that it is in good condition and fits correctly, could decrease the severity of a head injury, such as a skull fracture.